Posted on February 11, 2019 February 13, 2019 in Press Release. February is Teen Dating Violence Awareness Month and you are invited to Mohave Community College to learn how to avoid becoming a victim. 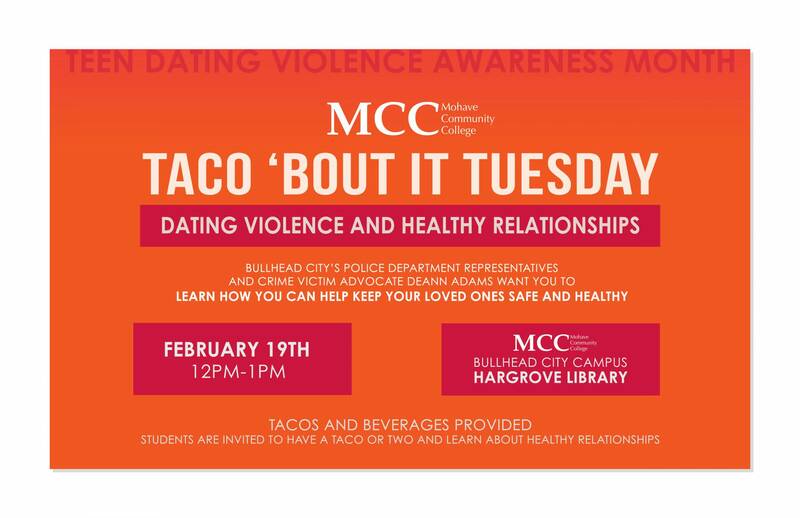 The free, one hour seminar is called Taco ‘bout it Tuesday: Dating Violence & Healthy Relationships. MCC, the Bullhead City Police Department and Bullhead City Prosecutor’s Office/Crime Victim Services Unit hope you can join us to learn how to prevent dating violence and abuse. You will also learn about healthy relationships. Detective Andrew Sevillano and Crime Victim Advocate Deann Adams want you to learn how you can help keep yourself and your loved ones safe and healthy. Adams will explain the Crime Victim Services Program, how they assist victims of crime, how the victims receive their rights under the Arizona Victim Rights Laws and how the criminal justice system works as it relates to a crime victim. There will be complimentary refreshments that include tacos and beverages. What: Taco ’bout it Tuesday. Refreshments include tacos and beverages.